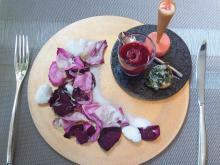 Dessert specialty restaurants and several tea salons are leading the trends for sweets. Chef Kazuyori Morita trained in France and each afternoon between lunch and dinner, Libertable, becomes a ‘salon de the’ with desserts and tea or champagne. Classical French desserts with a twist, for example Mont Blanc with a meringue made of porcini mushrooms or an Opera Cake that is served with a warm chocolate sauce. The sweets at Dessert le Comptoir by chef Yoshizaki Daisuke are more traditional, such as a chocolate soufflé or crème brulee. There is also a selection of take-away sweets like a milk rum confiture, cannelles, and pate de fruit. 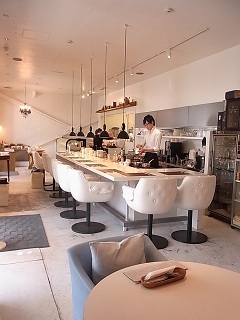 Kohta Yoshioka Patisserie Table has a long counter overlooking the open kitchen so diners can watch as chef Yoshioka assembles each dessert. Yoshioka has been with the Gordon Ramsay group, both in Tokyo and in London at La Noisette as a sous chef. The desserts are more traditional like lemon meringue tart or caramel, orange and apple crepe suzette.